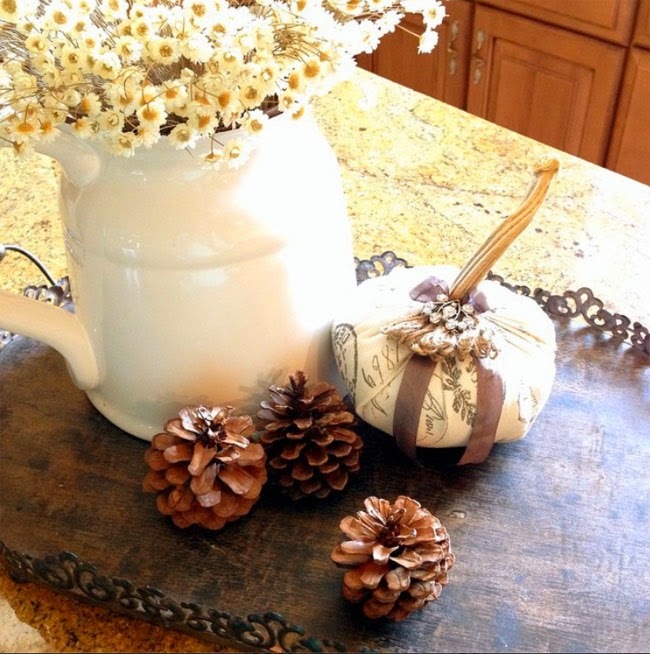 I just ADORE this little tray of pretty Fall things I've got sitting on my kitchen island right now. It's really pretty simple - which makes it perfect. Remember when I shared the pitcher and flowers just after I purchased them? Well that adorable handmade fabric pumpkin is something that just arrived this week…and I thought it was perfect to add to the tray! I was so excited to get it from my friend Tammy at Cloth and Patina. Remember Tammy? She's the one that supplied me with the pretty things for the "Unlock the Spirit of the Holiday Season" dessert table I did a few years ago. I adore her stuff and recently found her on Instagram! Yay! You can find Cloth and Patina on Facebook too - she's got a very loyal following of fans and shares the most beautiful creamy white home interiors and home decor photos - other people's photos as well as her own! Hope this inspires you to get decorating for Fall…just in case you haven't started! I've been going from one project deadline to the next - things seem like a whirlwind around here. I'm happy to say the "Friendsgiving" I've been dreaming about is officially on the calendar! Yay! Not sure the fire pit aspect will actually happen…like I'm pretty sure it WON'T happen at all. Boo! Oh!! And after 5 years of blogging I've finally got an official "ABOUT" page coming soon - stay tuned I'm pretty sure you'll be surprised by some of the things you may have never known… (oh the suspense…ha)!